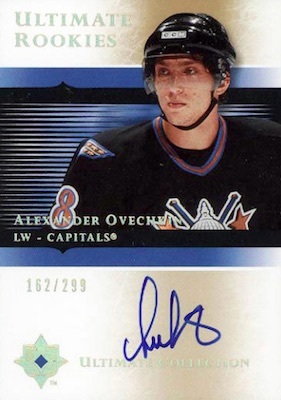 As one of the most prolific goal scorers in the modern NHL, Alexander Ovechkin rookie cards have long enjoyed hobby attention. Playoff success was the only thing missing from his lengthy résumé. However, that is no longer the case and Ovechkin rookie cards are pushing higher. The face of the Washington Capitals franchise, "the Great Eight" is a frequent All-Star, multi-time Hart Trophy winner, and often in contention for the Maurice "Rocket" Richard Trophy, which is awarded yearly to the player with the most goals. Still, a title remained out of reach for much of his career. Finally, he hoisted the Cup in 2018 as the Capitals defeated the Vegas Golden Knights. 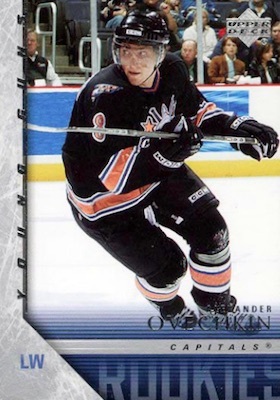 The top pick in the 2004 NHL Draft, Ovi has long battled Sidney Crosby for NHL success and hockey card supremacy. Crosby was the first-overall selection in 2005, but the two debuted together in 2005-06 because of the lockout in 2004-05. Both players have rookie cards in 2005-06 sets, making for a powerful one-two punch. The list below highlights some of the best Alexander Ovechkin rookie cards. You can also keep track of the most popular cards from his career by viewing current eBay auctions with the most bids. Shop for individual cards on eBay or check current prices below. 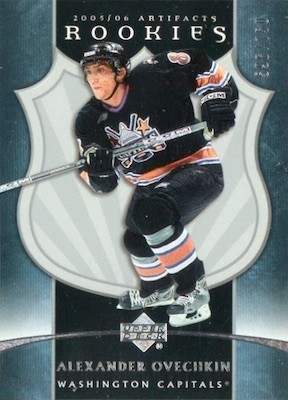 A foil Rookie Gems release, Ovechkin's base card in 2005-06 UD Black Diamond comes as part of the more elusive Quad Gems subset along with Crosby. Tough parallels include Ruby (#/100), Emerald (#/25), Gold (#/10) and the one-of-one Onyx. 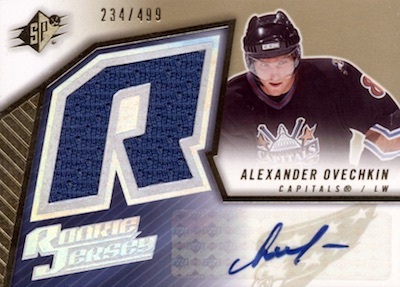 Numbered to 999, the 2005-06 UD Trilogy Alexander Ovechkin rookie is classic Upper Deck with a shiny and segmented design. The Rookie Premier subset features 50 cards and each box averages three rookie cards, so it is tougher to pull than it seems. Issued as a redemption card, the 2005-06 UD Artifacts card uses a large shield as the background. With 750 copies, it is among the rarest Ovi rookies without a signature. 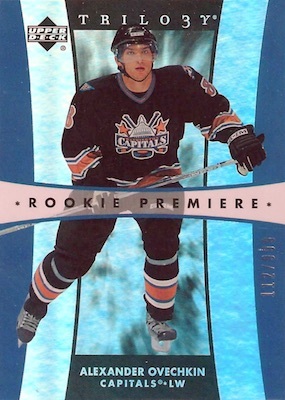 Providing updates to several earlier '05-06 releases, 2005-06 Upper Deck Rookie Update also has a key Ovechkin rookie. Part of the Rookie Inspirations line, first-year debuts were paired with veteran star players. Fellow Russian and first-overall pick (2001), Ilya Kovalchuk joins Ovi on the signed card limited to 199 copies. While Kovalchuk certainly had a notable NHL career of his own, it is safe to say that Ovechkin surpassed him. 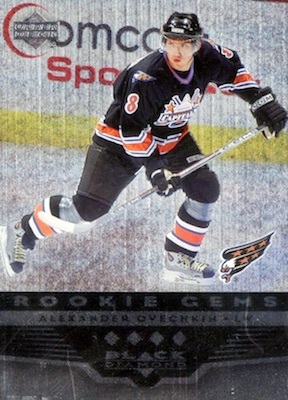 For many collectors, the Alexander Ovechkin Young Guns card is the rookie to own. Found in Series 2 of the 2005-06 Upper Deck flagship set, the cards are not even that rare, averaging 1:4 packs overall. Still, the power of the Young Guns line, which is neither signed or numbered, is largely unmatched. There is also a High Gloss parallel with just 10 copies, plus one-of-one UD Masterpiece printing plates. Even the low print run can't help the dull design and sticker autograph on the 2005-06 Hot Prospects Prized Prospects rookie. 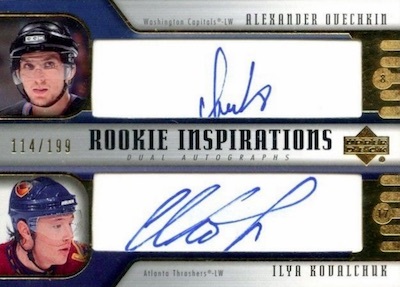 Nevertheless, an Alex Ovechkin rookie autograph is still noteworthy. A handful of names were short-printed to just 199 copies, with Ovi among them. He also has Red Hot (#/50), White Hot (#/5) and En Fuego (1/1) parallels. 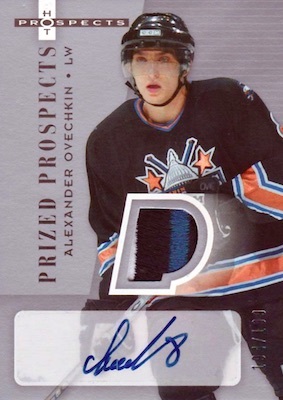 Going a little wild, the 2005-06 SPx Alexander Ovechkin rookie provides ample space for the die-cut "R" jersey swatch. It won't win any design contests but the brand strength helps interest. 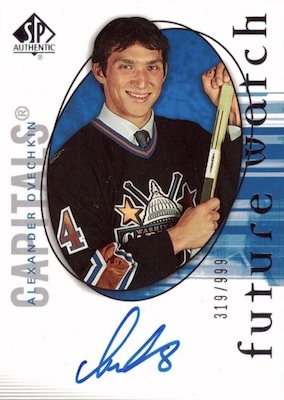 Getting to the very best options, Ovechkin has several rookie autographs in '05-06 Ultimate Collection but his Ultimate Rookies card is the top choice. Hard-signed and numbered to 299, the look is much cleaner than the SPx or Hot Prospects cards. Don't let the print run fool you as the Future Watch autograph in 2005-06 SP Authentic is a very popular Alexander Ovechkin rookie card. Even with nearly 1,000 copies, SP Authentic enjoys a loyal hobby following. The on-card signature is helpful, as well. It is crazy to see how young Ovechkin looked in his first season. The Ice Premieres card for Ovechkin earns the second spot on the list due mainly to the rarity. 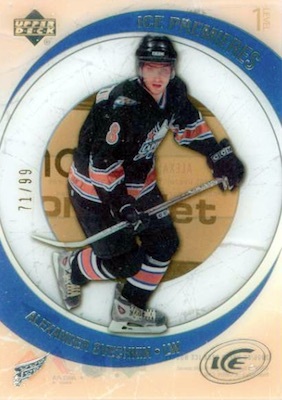 The Level 1 acetate rookie card in 2005-06 Upper Deck Ice has only 99 copies, meaning they are tough to locate and very expensive to buy if you do find one. Owning the top spot by a large margin, 2005-06 The Cup brings a very elaborate Ovi rookie card. Like the Ice card, it's limited to 99 copies, adding an on-card signature and jersey swatch. These high-end Alexander Ovechkin rookie cards regularly sell for thousands. 2005 - 06 - OVECHKIN ARTIFACTS ROOKIE CARD - #244 OF 750 - MINT!!!!! 2005-06 upper deck victory Alexander Ovechkin rookie Beckett grade 8.5! ALEXANDER OVECHKIN 2005 06 ULTIMATE COLLECTION ROOKIE AUTOGRAPH RC Mint !